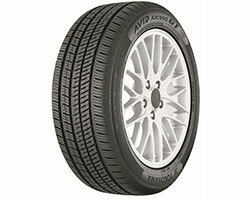 Yokohama Tire has a cool deal for the hot month of August: an AVID Ascend GT™ rebate. From August 1-31, consumers can cash in and get a $70 Yokohama Visa® Prepaid card after purchasing a set of four Ascend GTs, the new all-season tire which delivers powerful wet braking, snow traction, a quiet ride and long treadwear. -- Shorter wet braking is achieved by an all-new asymmetric tread design engineered to provide impressive stopping power and enhanced handling on wet roads.